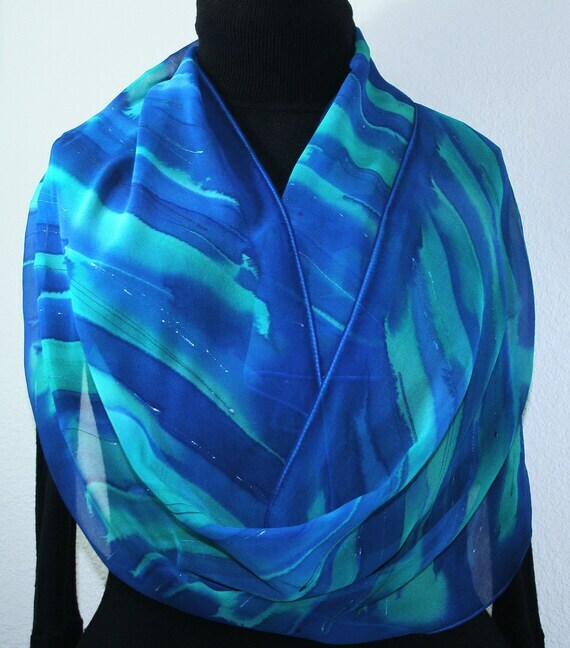 Blue Silk Scarf Hand Painted Turquoise Handmade Shawl LAGOON BLISS, by Silk Scarves Colorado. Select Your SIZE! Birthday Gift, Christmas Gift, Anniversary Gift. Bridesmaid Gift, Valentine Gift. Gift-Wrapped. Elegant Handmade Silk Scarf. Hand Dyed Silk. Handmade in Colorado, USA. 100% silk. This is a 100% Chiffon silk scarf featuring diagonal brushstrokes in shades of sapphire blue, French blue, teal, and turquoise blue; decorated with metallic accents in silver and metallic blue. It is an elegant and chic chiffon silk scarf that makes a beautiful accessory to any outfit.